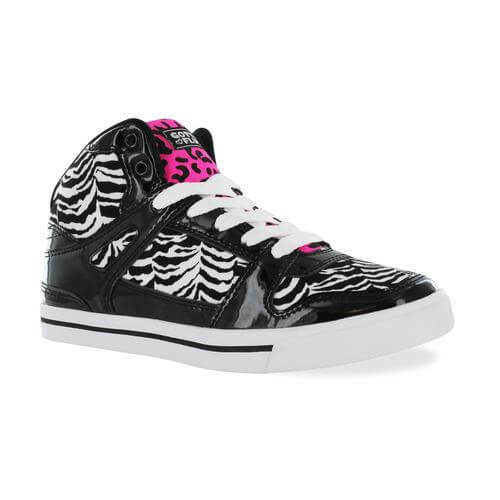 Latest Hip Hop Dance Apparel and shoes for sale online in a variety of styles for women and girls. 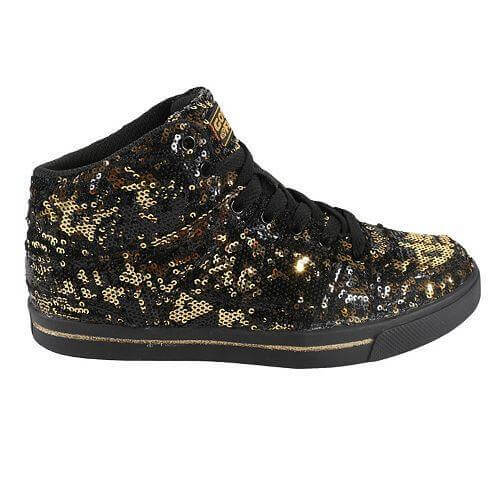 Balera Glitter Low-Top Dance Sneakers: Classic lace-up, low-top, canvas dance sneakers with uppers covered in shimmering glitter. Lightweight and flexible, these shoes are as comfortable as they are eye-catching. Cotton lining keeps feet cool and dry while dancing, and a non-marking, durable rubber outsole ensures stability. A clear polyurethane coating prevents glitter from rubbing off for long-lasting wearability. Imported.Suggested Fitting : Order same size as street shoe. Double Platinum Adult Metallic Harem Pants N7227: Get your boogie on in these amazing metallic harem pants! Features a loose fit through the hips, tapered legs, and a high waist that can be worn up or rolled down. Perfect for performances or costumes! Double Platinum Adult Two-Tone Metallic Tank Bra Top N7351: This sporty two-tone tank crop bra top features a front matte metallic stripe insert, a matte metallic t-strap racerback, and a matte metallic stretch band. Pair with the matching matte metallic side stripe leggings for a stylish outfit you can show off during your next team performance! 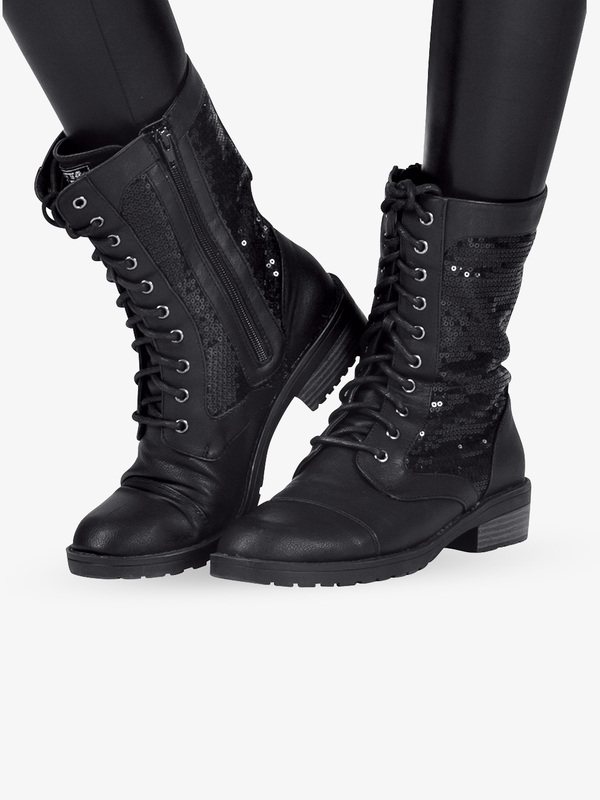 Double Platinum Adult Combat Boot SWAG: The hottest trend in footwear is hitting the stage! This performance combat boot features sequin side panels, square studs with a brushed nickel finish, and a side zipper for easy on and off action that's perfect for quick changes. The durable yet lightweight sole is ideal for dancing and has plenty of traction so you can wear these from stage to street! 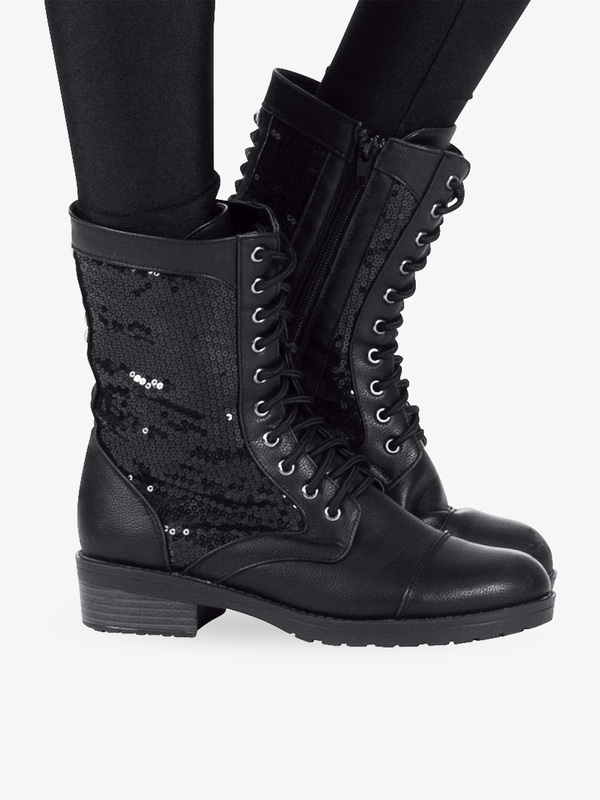 Double Platinum Girls Combat Boot SWAGC: The hottest trend in footwear is hitting the stage! This performance combat boot features sequin side panels, square studs with a brushed nickel finish, and a side zipper for easy on and off action that's perfect for quick changes. The durable yet lightweight sole is ideal for dancing and has plenty of traction so you can wear these from stage to street! Elisse by Double Platinum Womens Pants with Attached Faux Shirt N7457: Stay on-trend with these plaid shirt pants featuring a wide waistband and attached tie-front metallic plaid mock shirt with black lining. Perfect for outfits on and off stage! Elisse by Double Platinum Girls Pants with Attached Faux Shirt N7457C: Stay on-trend with these plaid shirt pants featuring a wide waistband and attached tie-front metallic plaid mock shirt at the waist with black lining. Perfect for outfits on and off stage! Gloves sold separately. Natalie Adult Unisex Cargo Pants with Drawstring Waist BP104: Get funky in this lightweight cargo! Pant features a drawstring waist and hemline. Machine wash in cold water with like colors.Men recommended to order one size larger. Natalie Child Cargo Pants with Drawstring Waist BP104C: This lightweight cargo pant features a drawstring waist and hemline. This pant is essential for funky performances. Machine wash in cold water with like colors. Natalie Adult High Waist Dance Shorts N8641: Update your dance wardrobe with these fashion forward high waist dance shorts. Natalie Adult Metallic Camisole Bra Top N8700: An instant favorite! This metallic camisole bra top features a crop styling, front lining, a covered elastic banding under the bust, and shine that can't be stopped! For best fit order 1 size larger. Natalie Adult Racerback Bra Top N8743: Racerback crop top features a front lining and a subtle sheen in the fabric to really make the color pop! This must-have basic goes with virtually any bottom and is perfect for layering under your favorite tops and tees! Dance Department Adult Asymmetrical Relaxed Camisole Top D3015: Who says your cover-up can't be adorable? You'll always look fashion-forward in this relaxed camisole top which features a scoop neckline and asymmetrical hem with long, flowy sides. Dance Department Adult Wide Arm Sleeveless High-low Top D3016: You're ready for class, yoga, an upbeat workout, or even a day out with friends in this sporty sleeveless top. Top features a jersey-like styling with wide arm holes, a scoop neckline, and trendy, asymmetrical, high front and low back hems. Pair with the matching ripped sweatpants for a complete outfit that's both edgy and comfortable! 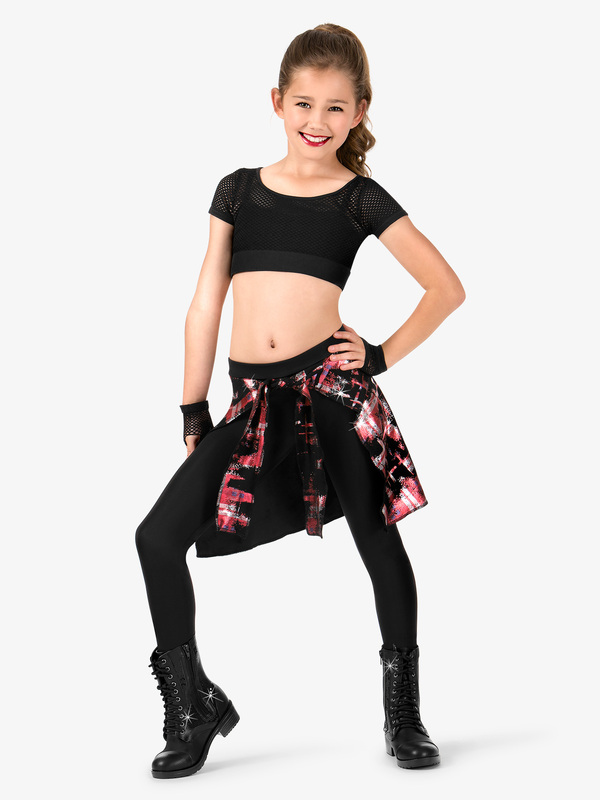 Dance Department Adult Ripped Sweat Pants D3018: Edgy ripped sweatpants feature a soft, stretch material, a wide 2.25-inch waistband, wide 2.25-inch ankle cuffs for a full-length or capri look, and tattered, distressed front leg rips. For a complete outfit, pair with your favorite bra top or with one of the matching tops or hoodies! Dance Department Adult Stretch Harem Hip-Hop Pants D3019: Amp up your performance with these comfy and versatile harem pants. Pants features gathered sides and tailored legs. Match with a slouchy tee for an everyday look, or get ready for competition in an edgy metallic bra top. 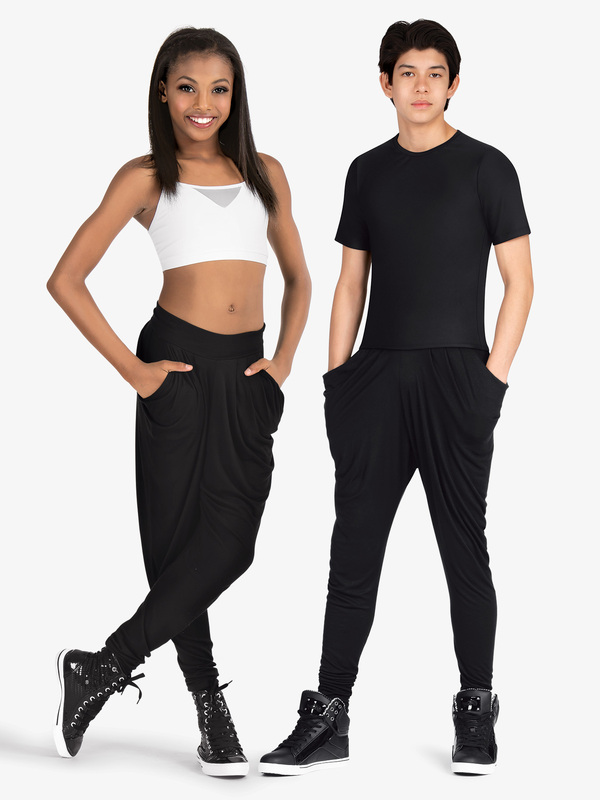 Dance Department Child Stretch Harem Hip-Hop Pants D3019C: Amp up your performance with these comfy and versatile harem pants. Pants features gathered sides and tailored legs. Match with a slouchy tee for an everyday look, or get ready for competition in an edgy metallic bra top. Dance Department Adult Jogger Sweat Pants DS621: Trendy jogger pants feature a 1.5-inch elastic waistband, front and back pockets, a slightly loose fit through the hips, and ribbed leg hems. Designed for women or men. 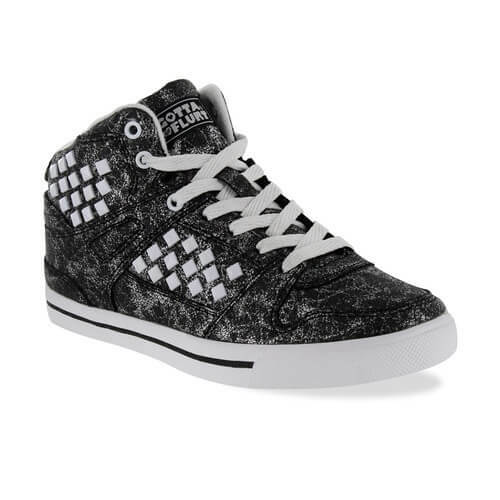 Double Platinum Adult Hi-Top Sequin Sneaker CHUXHI: Make a statement in these high top lace-up sequin sneakers! Features comfortable cushioned insoles and ventilated arches to keep feet cool. Perfect for performances or street wear! 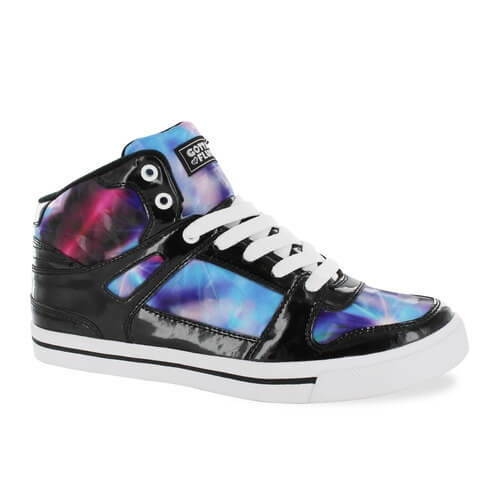 Double Platinum Girls Hi-Top Sequin Sneaker CHUXHIC: Make a statement in these high top lace-up sequin sneakers! Features comfortable cushioned insoles and ventilated arches to keep feet cool. Perfect for performances or street wear! Elisse by Double Platinum Womens Metallic Mesh 2-Piece Hip Hop Set N7458: Look fierce with the eye-catching style of this 2-piece set! Includes a short sleeve crop top with black fishnet upper and back, shoulder cutouts, silver metallic lower bodice and sleeves, and soft black trim. Stretch cargo pants with metallic silver waistband and decorative side rips with black fishnet inserts and tattered black trim also included. Black camisole bra top shown sold separately. Elisse by Double Platinum Girls Metallic Mesh 2-Piece Hip Hop Set N7458C: Look fierce with the eye-catching style of this 2-piece set! Includes a short sleeve crop top with black fishnet upper and back, shoulder cutouts, silver metallic lower bodice and sleeves, and soft black trim. Stretch cargo pants with metallic silver waistband and decorative side rips with black fishnet inserts and tattered black trim also included. Black camisole bra top shown sold separately. Balera French Terry Moto Joggers: French terry joggers with moto details along the front of the legs. Comfortable, ribbed elastic waistband. Imported.Fabric : Cotton/Polyester/Spandex. Balera Pop Star Pants With Straps: These low-rise pants have suspender-like straps on each side with adjustable D-rings. With functional zippers at the ankles and non-functional zipper detail on the thighs. Zip fly with snaps at the waistband. Imported.Fabric : Polyester. Balera Dash Striped Jogger: French terry joggers with color-block inset and stripes on sides of legs. With a comfortable, ribbed waistband and cuffs. Imported.Fabric : Polyester/Cotton/Spandex. Balera Paperbag Tie Waist Pants: A gathered, elastic waist peeks out from these tie-waist pants made from flexible woven rayon. The tie can be adjusted for a custom fit. Figure flattering. Imported. Balera Camouflage Hip-Hop Pants: These unisex, camouflage cargo pants have a drawstring waist and leg openings plus a zip fly. Imported.Fabric : Polyester. Balera Skinny Cotton Harem Pant: Constructed from a soft cotton/spandex blend, these harem pants have functional front pockets and a mid-rise waist. Imported.Fabric : Cotton/Polyester/Spandex. Balera Harem Sweatpants: These unisex harem sweatpants have a pleated waistline, front pockets and a wide, drawstring waistband. Imported.Fabric : Cotton/Polyester/Spandex.The drawstring on the gray pant matches the pant. It is not black as shown in the image. Balera Zipper-Detail Harem Pants: These French terry harem pants feature a hidden drawstring waistband, pleated knees and a functional back pocket. The oversized front pockets with faux zipper detail add a dramatic look. Imported.Fabric : Cotton/Polyester/Spandex. Balera Parachute Jogger Pants: These unisex, lightweight joggers are perfect for showing off your dance moves. With a ribbed waistband and cuffs and a drawstring waist. Imported.Fabric : Rayon/Nylon.For topworn with this style, see Cross-Back Knit Top - AH9002. Balera Sequin-Inset Jogger Pants: Joggers featuring liquid sequin insets down the side of each leg and a ribbed, drawstring waistband and ribbed cuffs. Imported.Fabric : Polyester/Cotton/Spandex. Balera Side Stripe Zipper Harem Pants: Bold colored harem pants with a dropped crotch and tapered legs. With side racing stripes and prominent zipper accents. Imported.Fabric : Cotton/Polyester/Spandex. Balera Side Stripe Track Pants: These side-stripe track pants feature a drawstring waist, ribbed ankle cuffs and functional front pockets. Imported.Fabric : Polyester/Spandex. Balera Triple-Stripe Jogger Pants: Flattering, slim-fit joggers with sporty stripes at the left thigh. Constructed of French terry with a rib knit waistband and cuffs. Imported.Fabric : Cotton/Polyester/Spandex. Balera Triple Color Block Harem Pants: These tri-color harem pants are constructed from a soft cotton/spandex blend and feature angled, color-block panels. With functional front pockets. Imported.Fabric : Cotton/Polyester/Spandex. Balera Matte Jersey Jogger Pants: Flattering, slim-fit joggers in bold colors made of matte jersey fabric with a wide, elastic waistband and cuffs. Imported.Fabric : Polyester/Spandex Matte Jersey. Balera Bike Shorts: Our longest-length shorts that hit at mid-thigh with a wide, elastic waistband that hits at natural waist. Made in USA.Fabric : Matte Nylon/Spandex.